Beginning September 1, 2017, Texas joins a handful of states that have enacted so-called “Blue Lives Matter” laws, which make attacks on law enforcement officials, including judges, a hate crime. Texas Governor Greg Abbott signed the legislation, known as H.B. 2908, into law in June 2017. The new law in Texas is actually an amendment to existing law that instructs a judge during a criminal trial to consider whether “the defendant intentionally selected the person against whom the offense was committed…because of the defendant’s bias or prejudice against a group identified by race, color, disability, religion , national origin or ancestry, age, gender or sexual preference.” The amendment adds “or by the status as a peace officer or judge” to the hate crime component judge’s must consider during trials alleging a crime was motivated by such prejudice. The law comes about one year after a devastating attack on Dallas police officers in which five officers were killed. Another attack in 2015 targeted a district judge outside her home. Which States Have Blue Lives Matter Laws? Texas isn’t the only state with a hate crime law specifically designed to punish attacks on police officers and judges. Louisiana was the first state to enact a Blue Lives Matter law in 2016. Kentucky and Mississippi have both passed similar legislation. Proposed Blue Lives Matter laws were raised in Virginia and Indiana but failed to pass. At least 12 other states are considering some form of police-oriented hate crime law. The new law punishes both physical attacks and threats that put police officers and judges in peril of being harmed or killed. If convicted of a hate crime under H.B. 2908, defendants face tough penalties. Under the new law, “making a terroristic threat that puts a police officer or judge in fear of imminent bodily injury” is a state felony that is punishable by up to two years in prison. Defendants convicted of unlawfully restraining or assaulting a police officer or judge are guilty of a second degree felony and face up to 20 years behind bars. Any crimes that result in bodily injury to a judge or police officer are first degree felonies that can carry a life sentence. According to an NBC News report, hate crimes jumped by 20 percent in nine metropolitan areas in 2016. The data was collected by a bipartisan research group from the Center for the Study of Hate & Extremism at California State University. 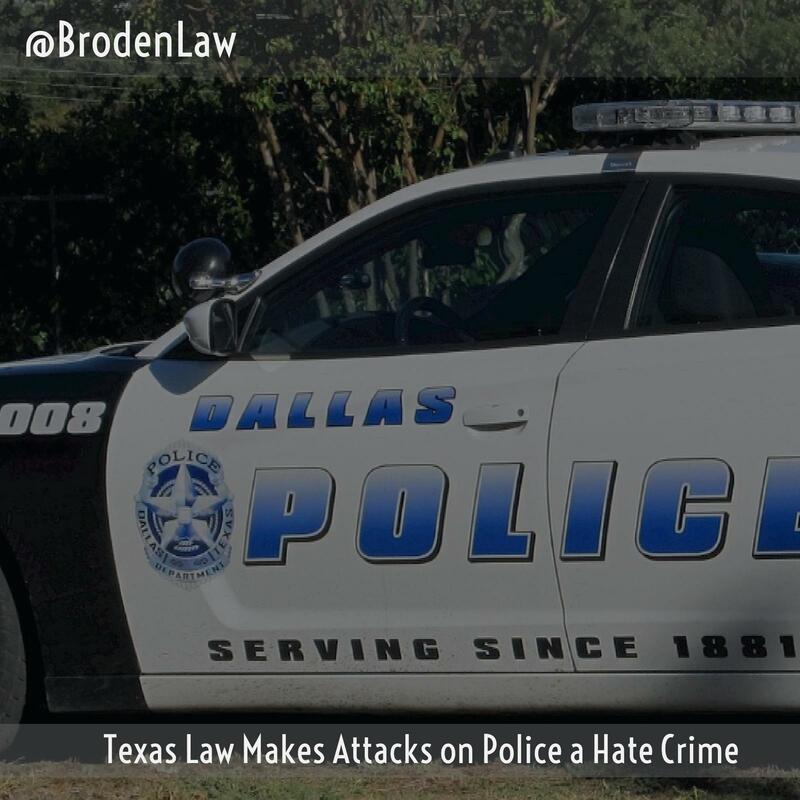 If you’ve been charged with a hate crime involving an incident with police officers, it’s important to get an experienced Texas criminal defense lawyer on your side as soon as possible. You have important legal rights. A lawyer will help you protect them.